As women, we are quite creative in finding something that can shake our confidence on the beach. So, before the event, we prepare. Some of us go to the gym, others start a diet, we book a holiday. Then we buy essentials: sunscreen, towel, beach bag, hat and of course, the perfect swimsuit. I’ve always found it challenging to find a bikini or swimsuit that would make me feel great. It was all about design, quality and style that covered my flaws and showed my beauty. It was 2010. I was young; I was healthy; breast cancer was totally unexpected. While dealing with the trauma of cancer treatment as graciously as I could, I longed to go to a far-flung beach, lay on a sun lounger, and put the whole experience behind me, even if for a short while. In fact, I wanted to take the fantasy even further and promised myself that when I had recovered enough strength after my mastectomy, I would go on holiday to Bali - to learn how to scuba dive! My search for mastectomy swimwear to wear on the beach for this important holiday (and while scuba diving if I didn't lose my nerve!) brought an unfortunate reality. Of the limited collections of pocketed bikinis and swimsuits available from mastectomy specialists’ shops, high street stores, and online, none of them suited me. Here I was, a young woman used to wearing beautiful, fashionable swimwear, forced to choose from swimwear made for post surgery comfort, yet far too conservative in design. Simply put, too much available then was plain and ugly. But let's start with the basics: What exactly is mastectomy swimwear in the first place? In a nutshell, mastectomy bathing costumes (also known as post surgery swimwear) are swimwear which has been specially designed for women who have undergone a range of breast surgeries that caused some degree of scarring and asymmetry. After breast surgery, some women choose to conceal the removed breast tissue. 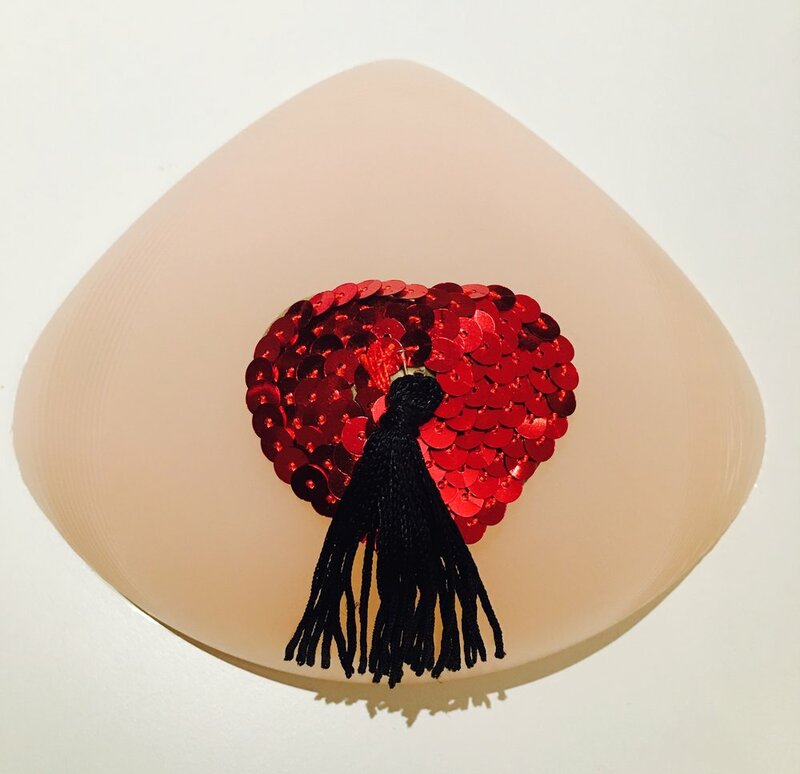 They recreate a breast shape using one or two mastectomy prosthesis for swimming (aka breast forms - see below) placed into specially-designed pockets of the mastectomy swimsuit or bikini. This helps them feel more confident in their mastectomy swimwear knowing their post-surgical chest looks and feels symmetrical. Other women choose not to wear breast forms, preferring the freedom of 'going flat and fabulous' in their swimwear! Ultimately, this a matter of personal choice. One in five breast cancers (20%) are now diagnosed in women aged under 50. Sadly, this isn't currently reflected in the post surgery swimwear options the same women encounter. I struggled to find a hot bikini that looked like something I would have worn before my diagnosis and included the comfort I needed after breast surgery. I started speaking with other women who had breast surgery or preventative mastectomies in person and online forums, asking where they bought their swimwear. We shared our mutual disappointment when seeking youthful, fashionable swimwear and coming away empty-handed. A few shared making do with plain, fit-for-purpose mastectomy swimwear, which made them feel ancient. What I found really upsetting was listening to women with mastectomy refusing to go on much-needed holidays or trips to the spa or pool. They spoke of feeling ashamed of their bodies when trying to see if they could get away wearing their existing swimwear, to find that it was too low cut under the arms or neckline, leaving their scars or their prosthesis showing. There are services out there which offer to sew breast form pockets into regular swimwear. This is a good temporary, low-cost fix, but once wet, these adapted swimsuits are more likely to sag and lose symmetry and reveal. My sheer frustration with my swimwear search motivated me to make my first pocketed bikini for my holiday! I combined my experience, research and design background to create it, And it was such a positive feeling to have the confidence to walk down the beach in that bikini - and go on to earn my PADI open water diving certificate! This deeply personal experience of this common problem inspired me to start designing swimwear specifically for women's needs after breast surgery and radiotherapy. After coming back from Bali, I began working hard to create Clover Lewis Swimwear. It was my new goal. I had a purpose: to support other women who lived through breast cancer. Clover Lewis Swimwear is now a collection of high-quality, glamorous and comfortable swimwear that conceals breast imbalances, scarring, and radiation burns, all of which can leave women feeling vulnerable and exposed when thinking about swimming. These bikinis and swimsuits will support a return to the pool, or holiday or spa, or even first scuba dive! Simply, all well-deserved activities to enjoy after experiencing breast surgery. It has been an incredible journey. Today I'm proud to share that my swimwear appeared in British Vogue - the first mastectomy swimwear label to appear in its entire 100 years publication! CLS was also awarded the UK Lingerie Awards ‘Post Surgery Brand of the Year' (which is the equivalent of the Oscars). Winning felt like a real victory for all the women I met with during my post surgery swimwear hunt! These both are clear signs that the fashion industry is becoming more open to the variety of physical and style needs of women after cancer. However, much more than just making comfortable swimwear, through Clover Lewis Swimwear I wish to encourage pride, body confidence and self-love in women who have had lumpectomy, mastectomy, reconstruction, and well as those women who choose not to reconstruct. Clothing has the power to change how people feel about themselves. That‘s why I came up with the brand’s strapline: ‘Look good outside, feel great inside’. I believe clothing as a statement can be a tool for women, especially after breast cancer. All women should be able to feel amazing in their bodies. Beach, pool, street, home… location doesn’t matter. Let’s use fashion to empower women. Fashion became my ‘body armour’, a distraction for friends and colleagues encountering me for the first time after finding out I had the ‘C’ word. Stylish dressing became my method of positive distraction, attracting the compliment ‘you look great!’ as the opener to a more upbeat conversation, instead of having to cope with receiving the quick glance at my chest, followed by the words that still make me cringe: ‘You look so well!’ Words I often heard from friends and colleagues who genuinely meant well but appeared to be quaking over what to say to me. Sooo… Next time you pass by a mirror, observe how beautiful your body IS ! Instead of focusing on your flaws (we all have them! ), think about how your own style and fashion can give you the power to look good and feel great! Ready for Style Secrets on how to look good outside, and feel great inside? Sign up to my VIP mailing list, and I will send you your very own Style after Breast Cancer Guide, filled with my Top 10 Post-cancer Secrets. Clover started designing mastectomy swimsuits and bikinis after struggling to find a stylish, beautiful post-surgery bikini to wear on her first holiday after a breast cancer diagnosis. The holiday? A trip to Bali to overcome her fears by learning how to scuba-dive. She made her first mastectomy bikini, got her PADI diving certificate wearing it, at that moment personally realised the connections between body image, clothing confidence for women with breast cancer. So despite the expectation to carry on with “life as normal” after cancer, this experience had a profound effect on Clover. It became the fuel for her mission creating beautiful swimwear for women to feel good about their bodies so they can swim again. Through Clover Lewis Swimwear, Clover helps women feel body confident… and feel like they belong on a beach. Older PostWhy is mastectomy swimwear so expensive?